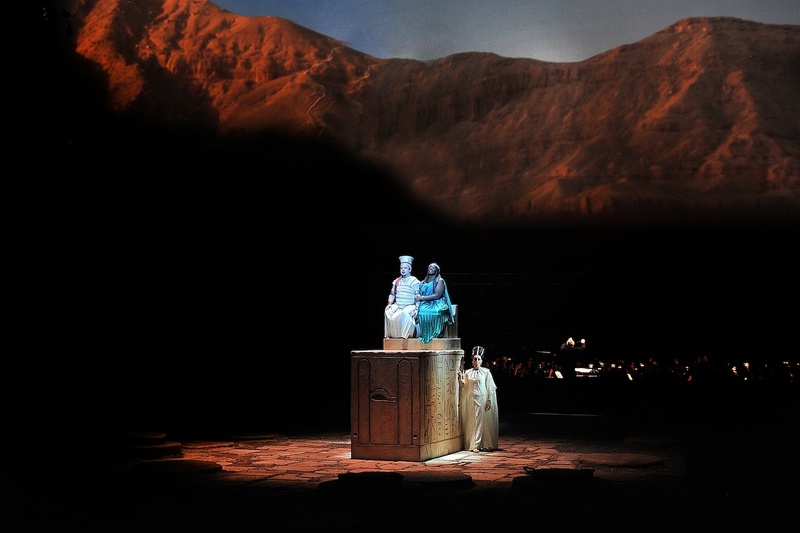 Working with Knifedge, we have produced another set of dramatic theatrical projections to act as the backdrop to a major new production of Verdi’s ‘Aida’ at The Royal Albert Hall. Isabella Bywater achieves an unbroken sequence of effective stage pictures. Projections on vast screens extend the audience’s vision to take in wider perspectives. The scene in the temple of Isis is thrilling[…]In the garden of Pharaoh’s daughter Amneris a fountain splashes, while the River Nile glistens in the background. This latest production of Verdi’s operatic masterpiece is co-produced by Raymond Gubbay and The Royal Albert Hall, and directed by Stephen Medcalf. It is widely regarded as Verdi’s most epic opera, telling the tragic story of a classic love triangle between slave girl Aida, the King’s daughter Amneris, and Captain of the Guards, Radames. The visual effects paint evocative pictures of Ancient Egypt onto huge curved gauzes, stretching around almost a quarter of the venue. We worked closely with set designer Isabella Bywater and lighting designer Andrew Bridge to blend its imagery into the overall design of the show. From the outset, Isabella Bywater gave us a strong vision of what she was looking for from our projections, which provide half of the entire scenic design for this show. With the help of Knifedge designers Louise Rhodes-Brown and Ilyas Khad, we’ve used a rich combination of photographic imagery, 3D renders, 2D drawings, animation and filmic effects to create the scene-setting projections. One of the challenges was to ensure that the scale and composition of the images was appropriate for the size of the venue. When projecting the inside of a temple, for example, we wanted the audience to feel like they are actually inside that temple, not simply looking at an image of it. We also knew that technical rehearsal time in the Royal Albert Hall would be at a premium, so we designed a solution which could be pre-programmed in advance, minimising set-up time for such complex image constructions. From a technical stand point, the rig consists of six 22K projections, driven by a Catalyst media server and run from a Hog lighting desk. 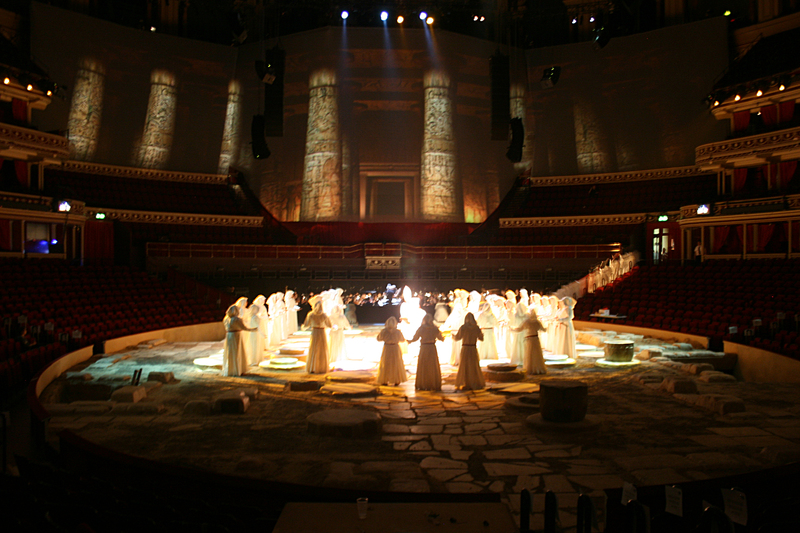 AIDA opened at The Royal Albert Hall on 23 February and runs at the venue until Sunday 11th March 2012.